Sharing templates, ISOs, and OVFs across vCenter instances has traditionally required the use of a shared NAS folder, sneaker net, or some other sync my stuff across the wire method. I compare it to the movie Hackers, where a team of scrappy young geeks go through a lot of trouble to share the contents of the Garbage folder on a mythical mainframe to clear their name. Oh, wait, side note! Zero Cool? Crashed fifteen hundred and seven computers in one day? Biggest crash in history, front page New York Times August 10th, 1988. Because 1500 isn’t enough. It has to be 1507. With the vSphere 6.0 release, VMware has developed a crude but effective way to share files across vCenter instances using a variety of different repository options. Dubbed the Content Library, it has been added to the major contextual menus and incorporated into a number of workflows, which is quite snazzy indeed. Let’s dive deeper into how they work using the Wahl Network lab with a Hackers twist. Finally, figure out where you’re going to put the stuff. 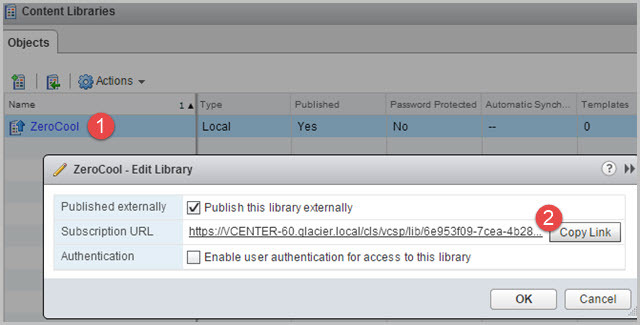 You can opt to use a local mnt point or drive on the vCenter Server, or use an existing datastore. I opted for the datastore option and used an NFS share on my ioSafe 1513+. That’s it. You now have a Content Library. Rejoice in the majesty of it all! There are a number of levers and knobs available for controlling content, both locally and remotely. If you want to snag that subscription link that leads to the JSON file, select the library and choose edit. Here you can toggle the publishing mode, copy the URL, and enable or disable authentication. There’s also a familiar permissions area where you can control who can manipulate the contents of the library. 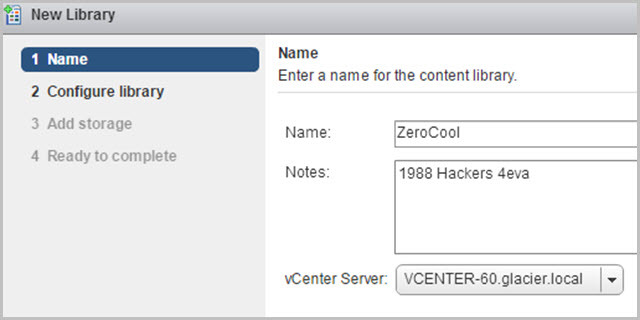 The users and groups below were the default settings for a fresh vCenter 6.0 installation. I also took a look at the JSON file (so happy they didn’t go with XML). The lib.JSON file contains the library data, while items.JSON contain the list of contents. As of the release candidate build, I was only able add OVF files using the web based import. I was hoping for OVA files. 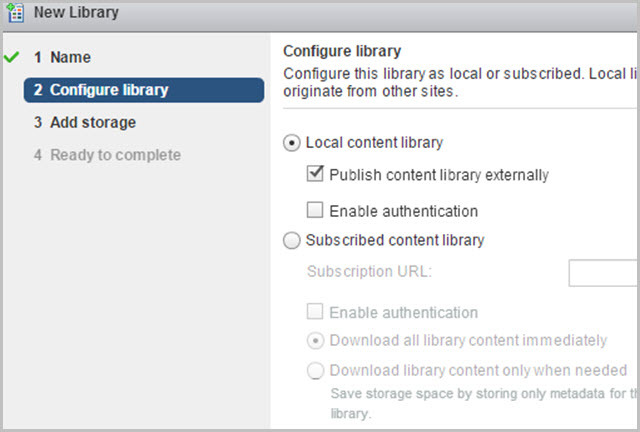 To use this feature, navigate to Home > vCenter Inventory Lists > Content Libraries > (Library Name) > Templates. From here, click the Import OVF package to library button. There’s not much to do – select the URL or local file path, give the item a name (or accept the default), and click OK.
Once added, you’ll see the item in the Templates section of your library. 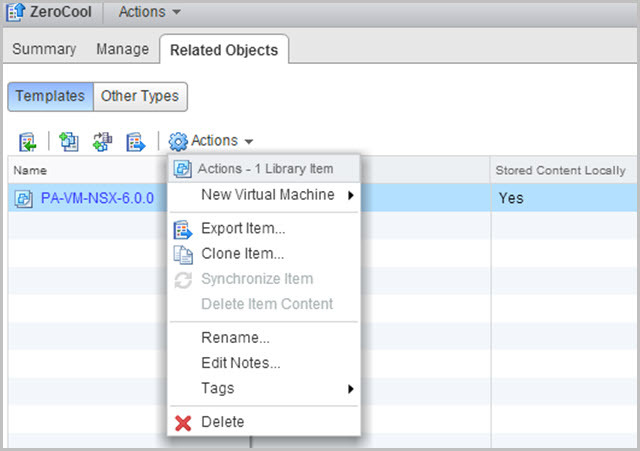 You can use the actions menu to build a new VM, export from the library, clone it elsewhere, and so on. You can also choose to clone an existing VM into the library. Choose a VM and then navigate to Actions > Clone > Clone to Template in Library. Here’s what the files look like within the file share. The files get their UID appended to their name for uniqueness. Alternatively, you could decide to add whatever else floats your boat to the Other Types area. By default, the import wizard is going to look for ISO files. I have found that if you try to import non-ISO files, the upload task fails. Today, it seems that Other Files equals ISO files. In the future, I’d like to also toss up scripts, client installers, and so on. I really dig the idea of having a shared Templates, OVF, and ISO repository that is easy to share across vCenter Servers. It provides a library of content that can be updated and pruned by the virtualization team, while also being part of the vSphere Web Client workflows. Being a “1.0” release, I’ll give it a little more time to ramp up on features before gazing my cynical eye upon it, but from testing I have found it useful already. It’s about time. Hopefully this allows a deploy OVF/OVA files from a DataStore. Instead of over the network. Yup, you can deploy templates or OVFs directly from the Content Library (no OVAs yet). It had to be 1507 to make it a jumbo hack….. I, too, like the sound of this, we currently have templates in one store, iso files in another, ovf files somewhere else, you get the picture. This should allow us to tidy it up and hopefully keep it synchronised at the DR site too. Nice writup and very well explained but Here I done CL PoC but not able to deploy vm from ovf template and I single vcenter with multiple Location based ESXi connected over mpls and wan. I also raised same issue to vmware, they said CL DaataStore not accessible with remote location esxi host that’s the root cause of failure. So do you really think it’s a valid reason and let me know if you have any suggestions for me. hi chris, i enjoyed talking during VMUG recently! is there a simple way to edit a template in a content library? e.g. I need to uncheck direct io option on vmxnet3 so that I’m not manually unchecking it on each vm in the future. Unfortunately, there is not. You would have to deploy the Content Library Item, make the edit and then check that back into the Catalog. The reason is the VM itself is not stored like a traditional VM Template (which is mostly controlled by a boolean in VC). A VM in Content Library is stored as an OVF which is immutable and this is why you’re not able to edit it directly. This is something I’ve mentioned to the PM already and perhaps this can be supported in the future. Let us know if you have any other feedback.